The Past in the Present program provides students with an opportunity to study local history. Students are able to explore, recognise and appreciate the history of Bournda National Park, by examining remains of the past and considering why they should be preserved. 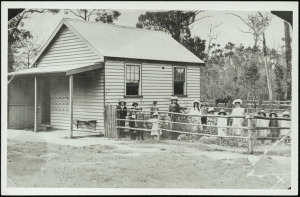 Through examination of significant persons, buildings and sites in Bournda National Park students learn about how Bournda has changed over time, from pre-European times through the time of early settlers and farming to the formation of a National Park in 1992. Significant places explored on the day include Wallagoot Lake, the old Bournda Road which dates back to 1859 and the site of the first school in Bournda established in the early 1900’s. Students follow the walking track which connects Scotts Bay and the Hobart Beach Camping Ground, following the shore of Wallagoot Lake. During this walk students may encounter sites that relate to Aboriginal occupation of this area. e.g. middens. Students learn about the importance of midden sites for Aboriginal people today, and why all Aboriginal artefacts and sites are protected by law. The emphasis is awareness and respect to help protect these special places. Students take a step back in time to the 1850’s and learn about what Bournda would have been like then. Students walk along the Bondi Lake track to the old Bournda Road and learn about when the road was first made in 1859 from diary extracts. The old Bournda School site is also explored through its location, old photographs and objects that would have been present at that time. 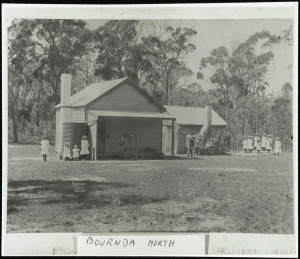 Students learn about how Bournda has changed over time. From the time of Aboriginal people before Europeans arrived in Australia, to the time of the early settlers and farmland, to the forming of a National Park in 1992. Students are given cards that represent different times in the history of Bournda National Park and then find their place on a time line marked on the ground. They then play the history tangram puzzle game to consolidate their learning. Empathetic understanding: developing an understanding of another’s views, life and decisions made.